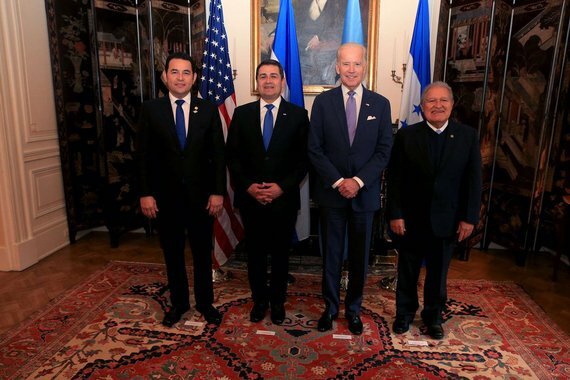 Vice President Joe Biden met in Washington on February 24th with the Presidents of El Salvador, Honduras and Guatemala to work on the Alliance for Prosperity that supports the three coffee producing Central American nations in crisis. Part of their crisis is due to the exploitative business model of the coffee industry, which is evident even in the coffee served at the White House: less than one cent per cup of coffee at the White House helps eradicate poverty in the coffee lands where it is produced, while the industry generates tens of billions in added value profits and taxes for the United States. Neither the coffee plantations nor most of the workers or their families are insured. Most of the workers live in poverty or in extreme poverty. An exception to the less than one cent per cup of coffee is when the coffee at the White House comes from Hawaii. The White House pays between US$35 and US$45 per pound of Hawaiian coffee while the Central American farmers receive on average less than US$1.30 for the fruit of their labor. Hardly enough to survive and not enough to lift their families out of poverty. The reality in the coffee lands is appalling, due to the exploitative business model of the industry, low prices in relation to production costs and the devastating financial sequel of coffee rust and drought still being felt in many coffee communities. According to the SCAA, Specialty Coffee Association of America, there is HUNGER IN THE COFFEELANDS a few months every year - see their report. Even if Vice President Joe Biden loves coffee, like many others in the White House who now use Chemex, the ultra cool coffee makers, Biden and the US Government do very little to make sure that each coffee consumed in the United States supports their policy to eradicate poverty in rural communities and achieve the Sustainable Development Goals. I believe the only solution is for the United States to work with major coffee companies to insure the farms and farmers that produce what the US imports with comprehensive agricultural insurance, and support a transparent Shared Value system that compensates the coffee communities with 10CentsPerCup served, as proposed by CAFE FOR CHANGE and WeShare. The present so called "sustainable", "FairTrade" or "ethical coffees" sold by American and European companies include a premium of less than 1/3 of a cent per cup for the producers. An insignificant amount that perpetuates a kinder but still cruel form of poverty light. Think about that the next time you are told about "FairTrade". It is unacceptable that anyone is poor or extremely poor in the booming coffee industry. Coffee has more than US$175 billion in consumption value per year and generates tens of billions of dollars in profits for rich investors and millions of good jobs in developed nations. I hope that the Central American Presidents brought their own roasted coffee to Washington to demand a transparent shared value system in order for their struggling citizens to share the wealth their hard work creates for companies in the United States and other developed nations. If this was the case, that cup of joe with Joe (Biden) could change the course of history in all coffee producing nations, eradicating poverty and creating a rural middle class in the coffee lands.